"The editors have done a remarkable job integrating a wide range of interdisciplinary experts for a comprehensive introduction to information science and technology. The book is a model of clarity, systematization and theoretical simplification - an indispensable text for students and professionals." 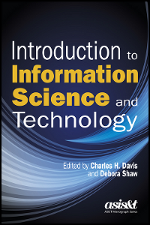 This guide to information science and technology presents a clear and concise guide to fundamental issues with appropriate theoretical backgrounds. Topics covered include information technologies, systems, representation; organization of information; information applications; user perspectives; social informatics; communication using information technologies and information policy. "This book should be valuable as a textbook and for self-study. It offers a readable overview of key topics, supplemented by a glossary and well-selected lists of references for further study." "Well-written work by the gurus of information science and technology! This is an easy-to-read text that will enhance students' grasp of an extensive assortment of information science and technology concepts." © 2011 - , Information Today, Inc.